This is the latest in a series of articles on the life and times of Kim Jong-pil, a two-time prime minister, based on extensive interviews with the 89-year-old. People began to refer to me as a man of twisted fate during the early 1960s, when I was pressured to resign from my official positions and go overseas. Even though I was at the center of a plan for a military revolution [coup], I was under consistent pressure from those in the political circle to step aside in their struggle for power. During my tenures abroad, I sometimes couldn’t see why I had to leave the country. But in hindsight, my experiences and what I had learned overseas all contributed later to my understanding of the world and leadership. I learned a lot from going one place to another in the United States and Europe. I spent the summer of 1963 in France during my first self-imposed exile, which was half voluntary and half forced. During my stay there, I followed French President Charles de Gaulle to every part of the country to listen to his speeches. Then he began to sing the French national anthem, “La Marseillaise,” in unison with the thousands of people who had attended the address. His oratory skills had my heart beating fast with excitement. He was a great speaker and a public provocateur. I sensed that he had the power of a politician willing to share the pain and happiness of his people. While de Gaulle deeply impressed me, so, too, did his wife, Yvonne de Gaulle. Though she was at every event at which her husband was present, she never stood before the public. Instead, she mostly stayed in the car to listen to her husband’s speeches. It was an exemplary case of a first lady looking after her husband. He was buried next to Anne in 1970 in his hometown, instead of being honored at the national cemetery as a war hero. His decision influenced me, and led me to decide that my gravesite will also be in my hometown in Buyeo [South Chungcheong] rather than in Seoul National Cemetery. Another political figure I greatly admire is Winston Churchill. He was a great leader with a distinctive personality marked by his hunger for intellect, his perseverance and autonomic mindset, as well as his dogmatism. Among these characteristics, one that stands out most for me was his unwavering determination to accomplish his goals. Without his strength as a leader, overcoming the challenges presented by World War II would have been much more difficult for Britain and taken a heavier toll. During my first overseas stay, I visited Churchill’s war room in the heart of London, where for three years he had devised war strategies in an underground bunker. I looked for a glimpse of his presence in that tiny, isolated space. I stood on the same podium where Churchill had stood 20 years before when he famously declared that “an iron curtain” had been drawn across the European continent. Just as the former British prime minister had talked about Europe’s struggle for freedom, I talked about Asia’s struggle for freedom. I drove to every corner of Europe in the first eight months during my first exile, traveling nearly 80,000 kilometers in total. In Germany, I drove a Mercedes more than 100 miles an hour (160 kilometers per hour) on the autobahn. Having seen the outside world, I could feel my global perspective was significantly expanded. 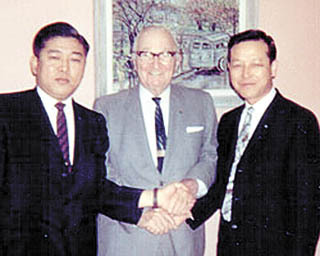 “If President Park Chung Hee had done what I did overseas, his perspective on world affairs would be widened to a new level,” I once said after my return to Korea. Park had been out of the country only twice – once to the U.S. and once to Taiwan – before becoming president. But even during his presidency, his contact with the local people and culture was greatly limited on official overseas trips. Deepening one’s perception of the world and of other people and their cultures is only feasible through direct contact with them, and attempting to acclimate to their way of life, which is impossible as president. When I indulged him with my experiences overseas, he would just stare at me, obviously envious. “You are a free man and thus can choose to do what pleases you. But how can I do that?” he would ask. I still find it regrettable that he could never leave Korea in order to see what more could be contributed to the good of the nation. In June 1964, I embarked on my second overseas journey to ease growing protests against diplomatic efforts to restore ties with Japan. I visited the Harry S. Truman Library and Museum in Independence, Missouri, in September that year and met with the former president, who had courageously decided to form the U.S.-led UN coalition forces to defend South Korea at the outset of the (1950-53) Korean War. During our hour-long meeting, President Truman told me that one of the most regrettable things he had done in his presidency was failing to unify the Korean Peninsula despite the huge loss of life during the conflict. He couldn’t push for the unification at the time, he said, because of daunting international opposition to that effort. I then asked what advice he had for a young political man from Korea. He spoke the truth. A politician by nature must be willing to serve the people. If he looks to gain from his political activities, it could be the end.